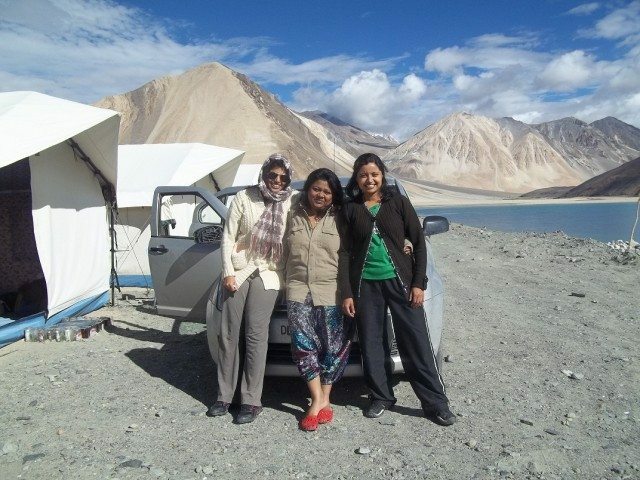 Our Leh Trip in August 2012 - Ghumakkar - Inspiring travel experiences. 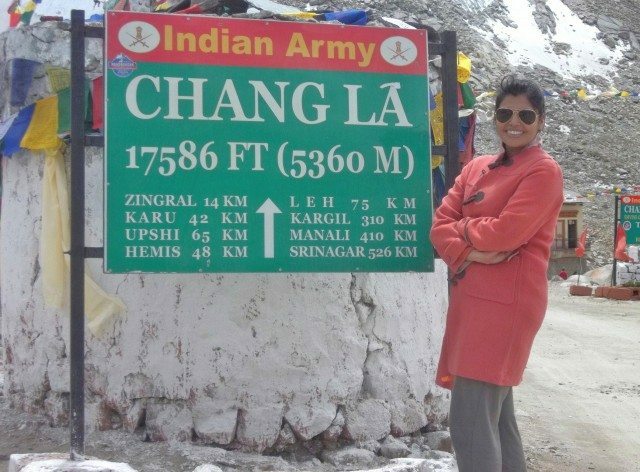 After a long discuss with friends and after checking so many websites, me and Surabhi finally start for the Leh on August 8th 2012, at night 8.00 P.M. by our car SWIFT DEZIRE. We heard a lot about the petrol problems and some time feel the same, so we take two cans of 25 ltr each with full of petrol too. Our first stop is a Dhaba near Chandigarh where Surabhi take her dinner and I take a cup of tea without milk and sugar. Because I have to drive whole night till Jammu so I skip my dinner. Any way we start by 12.30 from the Dhaba and after 15-20 km Surabhi sleep on her seat and I enjoy driving as well as kishor/lata’s songs. By 5.45 am on 09-08-2012 we reach Vijay nagar near Jammu from their I took a right turn to Udhampur, which is 67 km. From the spot and Jammu is 42 km. From their. So you can say I take a short-cut for Udhampur. Morning about 6.00 am. I felt sleepy and say to Surabhi, now you drive I am feeling sleepy. Then she take the driver seat and drive on the rough roads towards Udhampur. After an hour drive she saw a dhaba and stop the car for Tea, We fresh-en-up and take the tea- biscuits, etc. By 7.30 we start towards Srinagar from Udhampur. We were very exited to see and feel Leh so try to reach as near as we can. In the excitement of the same we didn’t stop at Srinagar (We had been in 2011 Jan) and we drive till sonmarg, by 6 pm. We reach sonmarg. Nice weather lots of greenery and cozy “ZUM-ZUM hotel” of sonmarg, after take our dinner we jump on the bed, and till morning 6.00 am we are sleeping. Next day 10-082012, at 7.30 am. 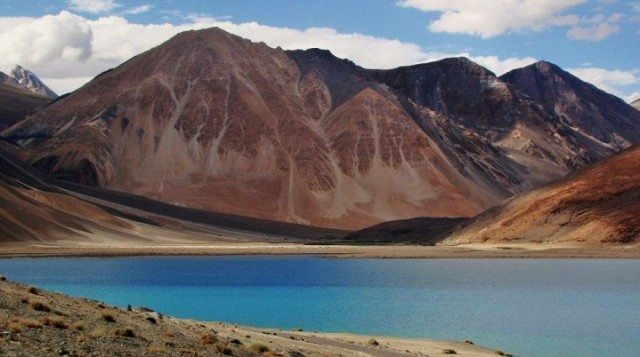 Three of our friends from pune/Mumbai called us and request us that we want to join you guys for the Leh trip. After a chat we call them to our hotel . And now we were ready and just waiting for our friends, so we decide lets go out from hotel and check the surrounding part of, in front of our hotel a river is their with a nice huge mountain, even in back of the hotel and both side of the hotel too the big mountains are their. We really like the location of the hotel as well as weather conditions too.by 12.00 pm. When we finish our breack-fast our friends reach to us. After a small conversation about the weather conditions and our itinery, we start by 12.45 from Sonmarg to Leh, but our next stop is Kargil. After crossing the sonmarg we entered the zozila-la pass. 2nd highest motorable road in the world. All 5 are seating quitly and enjoy the site scene as well as we all are worried and excited too. In the middle of the zozila pass our car’s tyre got punctured. Me and Avinash changed the tyre and girls are just watching and enjoying the weather and having fun. After 15-20 minute we fit the tyre and start again to Kargil. By 3.00 we reach Drass, all of us are feeling hungry so we decided to take lunch at Drass. Where we didn’t find the variety of foods, but yes we found chole chawal, roomali roti, gobhi ki sabzi etc. By 4.00 pm, we search a tyre repair shop to fix the puncture of tyre, the Drass is a small village but we found a puncture wala who know how to fix the puncture of a tube less tyre, after fix it we start from Drass to Leh, the journey from Drass to Leh is too cool. The weather and the sight of colorful mountains, river besides the road, and more over the road condition is also not in too bad like sonmarg to drass. We reached Drass by 8.00 pm. Now our first task to find a Nice and comfortable Hotel for ourselves, Because next morning we have to start from Kargil to Leh. After check some hotel we found one hotel named “Hotel Friends Inn” The hotel is new and rooms are specious, Me and Surabhi check in one room and the other 3 Avinash, Aditi, and Sonali are in the 2nd room. After taking our dinner we jump on the bed and sleep, we were little bit tired due to our 2nd day continuously from New Delhi. We start by 10 am. From Kargil to Leh, Kargil to Leh road condition is really nice and the site scenes are too good. 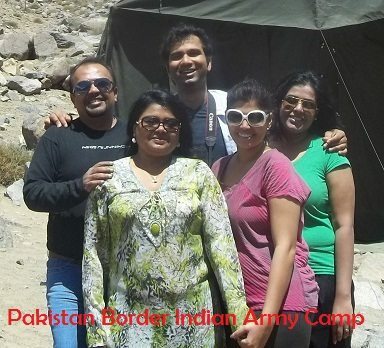 We really enjoy the journey from Kargil, some patches are really in bad conditions but over all it is good. From Lamayuru to Leh was the excellent. Next day 12th August 2012, Me and Surabhi awake by 7.30 morning and go out to see the Leh town. We took tea and lemon cake from a German Bakery from the main market. Tea and cake are really mouth watering in taste. 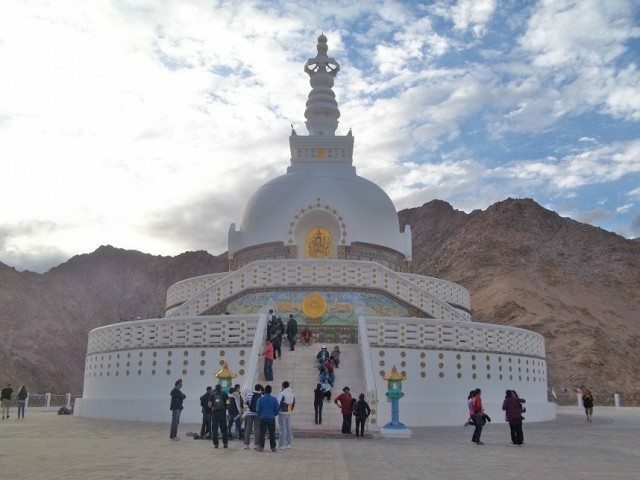 In the evening we go to see the Shati Stoopa, It is situated up on a hill, and the stairs from the down hill to Stupa (600+) we all see the stairs and did’t dare to climb the way. Then locals tell us their is another route from their you can drive your car till the Stupa. We came back by 7.30 and take our dinner and sleep. 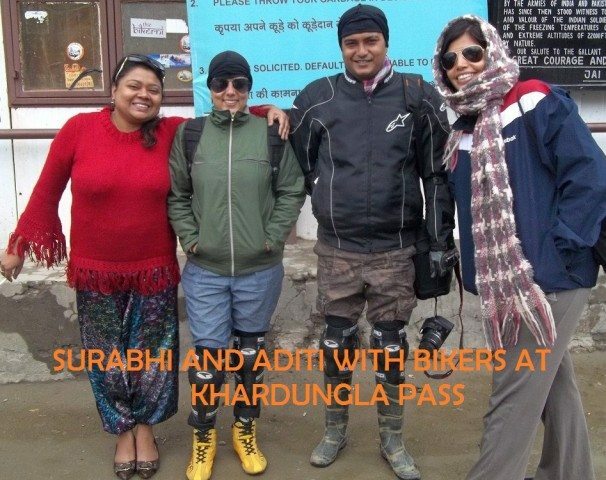 We all are ready and fit to explore “The Leh” our first destination to Nubra valley. We get up by 7.00 am and start to Nubra Valley by 8.30 am. We drive just 4-5 km. From leh and one of our friend feeling hungry and said please stop the car in front of any hotel to take some food. Any way after 30 minute drive we found one small road side cafe, and their she take some bread and butter etc. 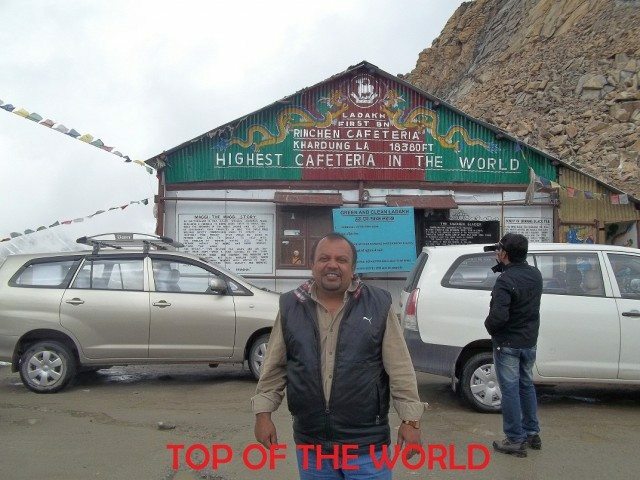 Then we start to Nubra, On the way of nubra valley we cross the worlds highest motorable road “Khardungla pass” we stop at khardungla cafe which is “world’s highest cafe” run by indian army. We all take black tea hear. Khardungla is situated 18350 feet from the sea lavel and oxygen is very low their, we all feel the same little bit altitude problem. We stay their 30 minutes, Aditi one of our friend is busy in photography, and roaming around rest of us are just sit beside the car, we met some bikers their, now-a-days many Indians are coming by bike too. 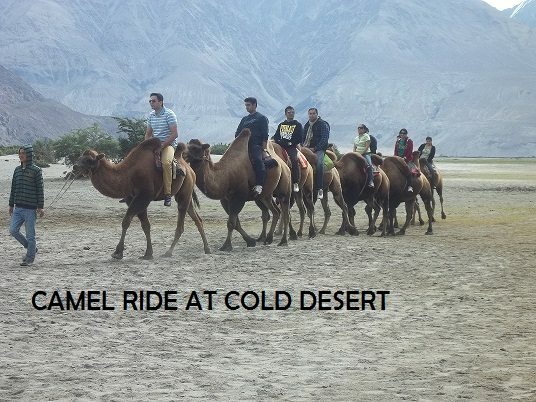 Now our next destination is cold desert of the world which is on the way near Nubra. It is one of best place for photography. We spend 10-15 minutes on this cold desert. Then we move to our camp near the desert “Sand Doon Resort”. We stay in tent, the facility, food and staff of the camp are very nice. Next morning we plan back to Leh. We start by 11.30 am. to Leh. Road is nice and we reach by 3.00 pm to Leh, We take our Lunch at a road side dhaba and start to Pangong. On the way of pangong we cross the Changla Pass which is no. 3 highest point of the world. We reach Pangong by 8.00 pm. And their we stay in front to Pangong Lake in two tants. Night is really cold at Pangong Lake and a little bit breathing problem we face. Any ways we take our dinner at the restaurant and their we met another cute couple (Tandra and Dheeraj) they are from Pune, they came by Air from Pune and hire bike to explore Leh. Next morning we all wake-up very early and see the Sunrise. The lake change its colour time to time, We seen all three colours of lake, early morning it look mudy brown, then by sunrise it look light green after 10 am it look blue. We take our break-fast and after some chat with other guys they are in tent next to us. From pangong the two of our friends Avinash and Sonali depart from us. Avinash told us they want to stay one more night at pongong and we 3 me, Surabhi and Aditi come back to Leh. Drive till Leh is very smooth and we reach by 4.00 pm, we all are tired so we take rest at our rooms. After a nape by 7.00 pm. We wake-up and going out to see the leh main bazaar, for a walk, we again meet Tandra and Dheeraj their, we all take dinner together, Dheeraj told us lots of things about his life at pune. All 5 are well travelled, we all share our travel experiences. By 11.30 pm. We came back to our hotel. On 16th morning Aditi want to stay one more day so Me and Surabhi decide to start our journey towards Delhi via Manali. Aditi wake up early she is going for rafting. We take our breakfast at a German bakery. Me try Lamon cack and tea, Surabhi take apple pie and tea. We check out the hotel by 10.00 am. We need cash for next three days journey so we go to ATM, one is with empty cash, second one in not in working condition, the third one is out of order. Then we find another one HDFC, it is also empty, after a request to the bank officer, he tell us two ATM machines are empty, you can withdraw the cash from the third one, which is in working condition. Thank to god we withdraw cash for the next three days. Now our next task is filling the petrol. We go to the petrol pump, their petrol in not available. But it is not a big problem for us, we have enough petrol to reach Manali which is 475 km. From Leh. Half tank in the car and 50 ltr. In the stock. We start from Leh by 12.00 noon, after 50 km. on the way to manali we found one petrol pump. We fill it tank again. Now we have enough petrol to reach delhi. The roads are good in shape some patches are not good but motorable. We face another puncher problem on the way. It was not a puncher, a peace of a big stone brust the tubeless tyre. Me change the tyre Surabhi help me for the same. Any way we manage it all and start our journey, now roads are in very bad shape, you can’t say it the road, we feel it was an off road drive, any way we reach sarchu by 8.00 pm. We decide night stay hear. And next morning again to manali. In sarchu again we stay at a tent. But tent is just a tent not with attach toilet or any other facility. Owner of the tent is a lady, she run a dhaba too, who provide food, tea, pepsi, etc. Nice in nature, we take our dinner me take rice and dal, Surabhi take mutton rice. After the dinner we go to sleep at our tent. Early morning me wake up and my first task of the day is to find the puncher wala and fit the Stepney for rest of our journey. Their is only one shop the owner of the shop is not very co-operative, He charge 900 Rs. For the tube and fittings. 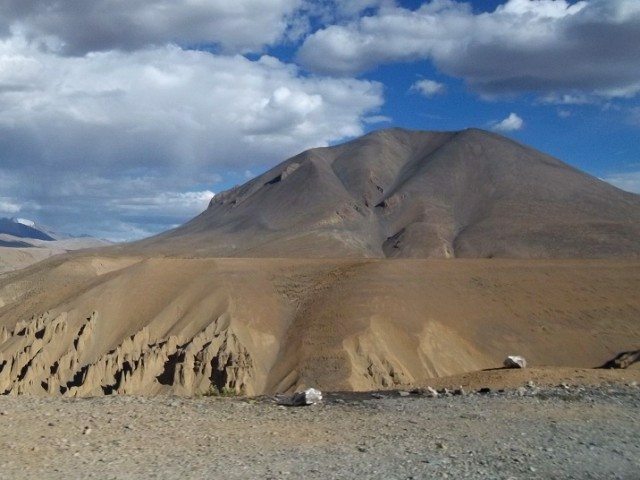 (we learn a lesson for the future keep a tube in the car for this kind of journey) any way we start again from sarchu, our today’s task to reach Manali. 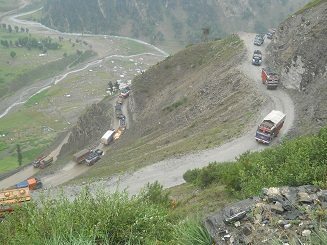 This is the toughest part of the journey, where we cross the Tangla Pass the 2nd highest point of the world. we drive very carefully on this road (?) we take our lunch by 2.00 pm. on the way at a dhaba, he cook fresh dal chawal. We finish our lunch and again start to manali. Because of the land slide the road condition is worst on this patch. Lots of land-slides and on the way to Rohtang-manali 5 km. Is full of Mud, car slip like anything on the mud, But we manage and reach manali by 6 pm. We check in a nice cosy and comfortable hotel in Manali, we are tired to stay in tent last night. We found a nice hotel. We both are tired so we take our dinner at the room and sleep. Next morning we start by 11.00 from manali to delhi, roads are now fine and we are fresh so we just enjoy the journey and on the way Surabhi seen some apple tree and want to click pictures with apple tree. We stop one of the orchard and take some pictures, their we saw a board about the tree house, it is 1 km. From the main road and 20 km. From manali, we go and check the tree house, and said to the owner next time when we come to manali we want to stay at your tree house for one day. It is surrounding lots of apple tree. We reach Chandigarh by 8.00 pm, their we take our dinner and start to Delhi, we reach delhi by 12.30 pm. And home south delhi by 1.00 am. jump on the bed till next day 11 am. So friends this is our trip to leh by car in 9 days. After completed my post graduation I choose printing industry for my carrier, Now working as a Marketing Head in one of the best printing house. Due to my work can't get lots of time for my hobbies but can manage 5-6 (short vacations) in a year. Love traveling, New friends, dance, and parties. Rest when we meet. Previous articleWanderings in South Goa. Very nice writing picutres so good. Camel in cold desert nice to see how Camel survive in hot and cold weather. Thanks a lot for share your journey. A long journey ????? ?? ????? ??? ?? ?? ?? ????? ?? ?????? ????? ??? First of all a warm welcome to ghumakkar family. very interesting narration and beautiful photos, Thanks for sharing this beautiful travelogue with us. This is my first write up in the traveling segment. Thanks a lot to for your ideas. Will try to write some more on this subject in various destinations I had been. Thanks again to all of you. Welcome to the ghumakkar family, Ajay. I am sure that you had a great time in Leh. 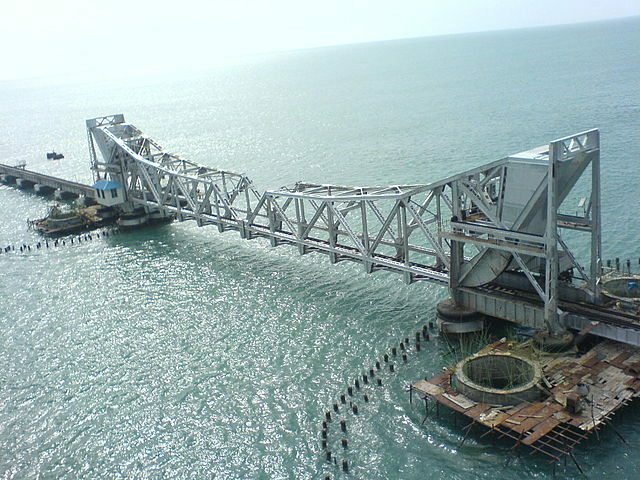 One blog is just not enough to cover a 9 day trip since I am sure that there have been many memorable incidents which you were not able to mention. You should have split it up into at least 3 instalments. The travel was very interesting. First leg drive of almost 24 hours is awesome. Nice pics and detailed accounts. Petrol in cans is an interesting idea. 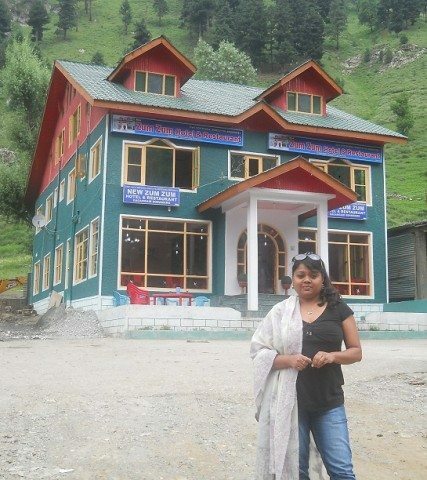 Last year we went from Manali side till Keylong. They have not yet repaired the patch before Rohtang. Once again, thanks for details. Very well written post , as suggested by our other fiends its could be divided into multiple parts & we could have enjoyed more pictures too. The information about hotels (esp the one in Kargil, ‘Friends Inn’) is going to be very useful to fellow Ghumakkars. Driving such long distances needs a lot of conviction and passion and you demonstrated both of them amply. Please continue to write more.